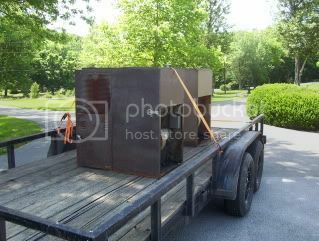 Went to an auction in Beaver Dam, KY yesterday as they had a "Pile of coal" and "Coal stoves" listed and it was only about 40 miles away. I bought what appears to be a good 77B and another for parts. Let a dandy smaller Stokermatic get away, and quit bidding on a mint 77L9 as it went way over $100. What do these things weigh? Good grief, it took 6 healthy men to get it rolled up the ramps on a fairly low trailer! I scooped all the coal I dared out of both units before loading and we still barely got them up the ramp. I need my trailer for other things this afternoon and I'm now faced with unloading by myself. The darker unit in front is complete & appears in good condition. 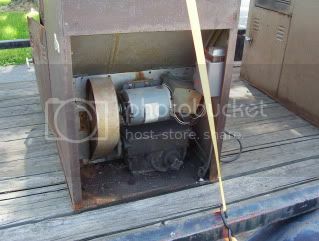 The lighter colored unit has been scrounged off for the squirrel cage fan and motor, but appears complete otherwise, it does have a repaired hopper however. Those are some beastly units. I thought my DS-1600 was heavy with four guys taking it off my truck. Clearly the DS is nothing compared to those units. What's the BTU output of those monsters? GOOD BUY! I think you'll like them. Getting the air and fuel feed set correctly is probably the most trying thing, after that, it's just set it and forget it. I do recommend using it as an "add-on" furnace rather than a stand alone unit. 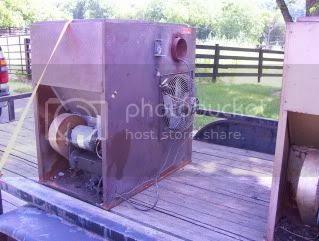 They produce too much heat when not used with a big squirrel cage blower fan and tend to crack and warp the heat exchangers rather quickly; also, using them as a stand-alone unit tends to make them fairly inefficient with high stack temps. Even when used as an add-on furnace I highly recommend a "magic-heat" type heat reclaimer on the stack. I would also highly recommend removing the stock combustion blower motor setup and putting an independent blower and feed motor on the unit. The transmission should be taken apart immediately and cleaned, new seals and MOS2 with heavy gear oil added. Hopper corrosion is common and not a huge problem, just cut out pieces that are rusted through and screw or rivet in a new sheet (seal it well) also, use oiled coal and periodically, when the hopper is low, spray something like crc marine coating or lps 3 on the hopper. I also like to use a smaller feed pulley than the smallest one currently on the drive pully (with the fan) with even moderate BTU coal, the low feed is more than adequate. Check for cracks in the heat exchanger around the clinker door and weld these as necessary. I managed to get them both off the trailer by myself. Dented the lower cabinet on the spare a little, so I cut a 1X4 and put it on the good unit with a couple of self tapping screws to prevent the problem. Ended up pulling them off with the 4 wheeler. A sheet of sanded plywood on the ramps and they slid off pretty slick & easy. Berlin, do you have the pdf owners manual you could email me? Seriously, does anyone know what these things weigh? I'll post a few more pics once I start cleaning them up. I passed on the mint 77L9 as I really don't have a place to use these anyway and the guy I let have it seemed to really want/need the unit. I may end up with one of mine in my living space in 2013-14 as I have no basement to tie it into my central system. I'm hesitant based on Berlins knowledge and the fact that of the several I've been around they're all loud when they come on. ETA: The 77 L9 was still in use.....heating a pool (Billiard) hall! I have a manual for the 77B if you still need it. Good Lord... they look like Sherman Tanks I went to a yard sale last week the dude had several of those Magic Heat thingies (with the box and they looked new) for $20.00 each (Ill knock on the dudes door if you do want them? 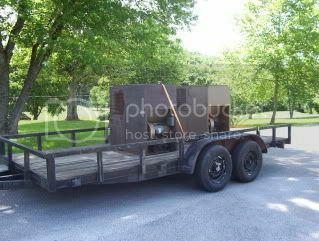 They are beastly I was lucky the lady I bought mine from had a overhead hoist in the shop it was at and I was able to lift it up and back my truck under it then lower it on the bed. Me and my wife got in set into place (mostly me) I bet they are close to 400 lbs empty. Last edited by Fastback71 on Wed. Dec. 13, 2017 10:44 pm, edited 1 time in total. Carpentersville, IL! That's just down the road a bit from me! I always thought they were made in Ohio by Wil-Burt Mfg. Welcome to the forum! What part of Indiana are you from? I used to live down that way (Jasper and French Lick) a long time ago (30+ years) and even had a next door neighbor that was a manager/supervisor at one of the strip mines in the area. My dad got some of the coal one winter to burn in our Woodchuck add-on furnace and it burned like a tire fire soaked in Bunker C fuel oil. Soot doesn't even begin to describe it. I'm guessing burning it in a stoker will be a much different experience.